Local myth talks about fantasy creatures that live at the center of the forest. They say it’s always been an enchanted place. And some stories talk about the heart of the forest, a fey-enchanted shrubs whose berries have magical and curatives qualities. The real backstory is unknown to most people. A powerful fey had it’s home at the center of the forest, more than 400 years ago. He passed away naturally, but his essence and spirit remained, becoming a protective shield for the forest. At the center a tree grew to enormous size; it’s trunk has a passage that goes deep into the earth, to a chamber that hides the magical shrub, which is the heart of the forest. Recently a band of orcs has been threatening the welfare of the forest, they are still far from the center, and ignore the qualities of the enchanted tree. PC’s might arrive here looking for the magic berries to become more powerful, or to use them for their curative qualities. Serphina, a dryad, is bound to the tree; the forest’s heart can communicate through her, it communicates only through emotions, not words. There is a band of centaurs that live in the forest, Serphine is in love with their leader. If the tree or any animal or fey is attacked within 200 ft. from the forest’s heart. 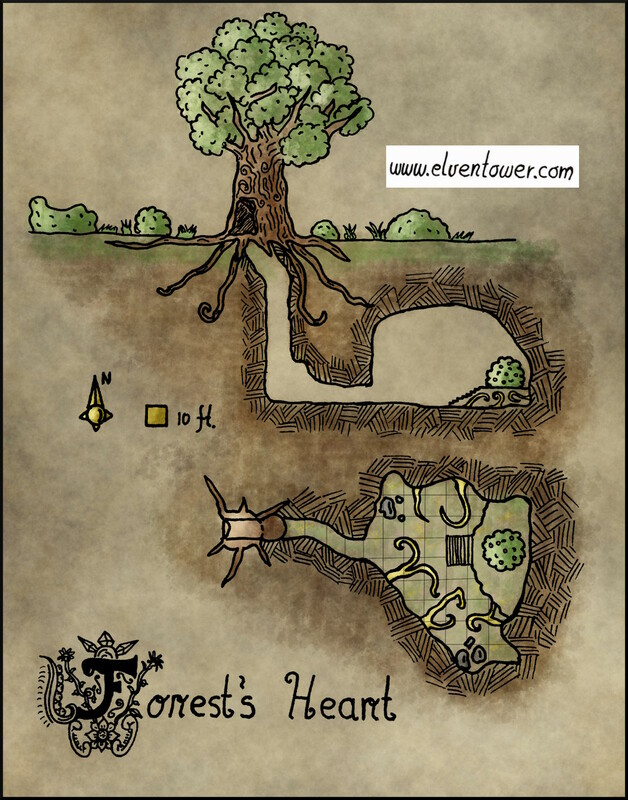 The heart can immediately cast Conjure Woodland Beings to protect the forest. It can also teleport up to 6 centaurs to the outside of the tree to help defend it. If they are killed, then the tree and the heart are vulnerable. If the forest’s heart (the shrub) is destroyed, the forest starts to die, this can’t be stopped. If the PCs are good-aligned, then Serphine might offer magical berries in exchange for getting rid of the orcs. It could be a really hard encounter if you want the centaurs to help. The magical fey berries can have different effects, according to the adventure and party level. They could cure any disease, or confer a Blessing of Health or Blessing of Magic Resistance. Alternatively, for a lesser reward, it could confer a Charm of animal conjuring or a Charm of Vitality. If the PCs desecrated the forest in search for power and killed any fey creature. Then the Forest’s Heart will try to kill them with the berries. When the PC’s eat them, the berries confer a Blessing or Charm as normally intended. But after a long rest, The PCs have to roll a CON save. The result and difficulty depends on party level and whether they destroyed the heart or not. Recommended consequence for a 5th level party: CON save (DC 15). On a failed save, CON score is permanently reduced by 2.